1845: John Minto writes of the grandson of a European shipwreck survivor from a wreck on Nehalem Beach, and mentions a Captain R. W. Morrison who found an iron cannon on Nehalem Beach sometime in the 1840s. 1877: The Smithsonian’s Contributions to American Ethnology reports on “Early Visits of White Men” to the Pacific Northwest, noting the Beeswax Wreck and two others. 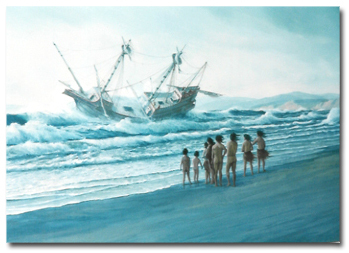 Of the Beeswax Wreck, it is noted that survivors lived with the Nehalem Indians “for some time”, and that when the fight between the survivors and the Nehalem broke out the survivors “resisted, throwing stones behind them and under their arms with great force, as the Indians say.” An account of the Indians first encounter with muskets, perhaps? 1894: Pieces of an “ancient wreck” wash ashore at Arch Cape and are reported on by local newspapers. 1898: Thomas Rogers publishes Nehalem: A Story of the Pacific, A.D. 1700, a fictionalized account of the Beeswax Wreck and its survivors. 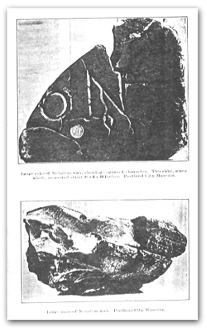 1899-1900: The Oregon Native Son, a journal of the history of the Oregon territory, publishes several articles on the Beeswax Wreck and other prehistoric wrecks on the Oregon coast. 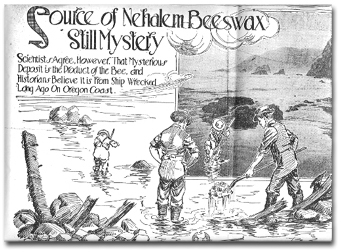 1900-1920: Numerous articles argue back and forth on the source of the beeswax at Nehalem, and whether or not it was from a prehistoric shipwreck or was natural mineral wax. That it was clearly beeswax from a shipwreck seems to have been generally agreed upon by 1920. 1927: Daniel Howard writes the novel Oregon’s First White Men, another fictionalized account of the Beeswax Wreck and its survivors. 1929: Edward Cherry proposes a plan to build a coffer dam around the Beeswax Wreck to excavate it, but the plan is never acted upon. 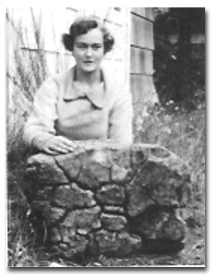 1950s: Eb Giesecke, a Northwest historian, begins interviewing Oregon coast residents about their knowledge of the Beeswax Wreck and their memories of seeing wreckage as children, and starts 50+ years of researching the Beeswax Wreck. 1950-1979: Various books are written on Northwest shipwrecks and Oregon history, noting the prehistoric wrecks on the Oregon coast and offering different explanations for which ships they could be and when they wrecked. 1978: Nancy Obrist, in an interview published in 1978 noted that several years before her and her husband were walking the beach “south of Manzanita” and came upon the remains of an old ship that she thinks was made of teak wood, and which “only comes up at low tides.” This may be the last sighting of the wreck near the river mouth. 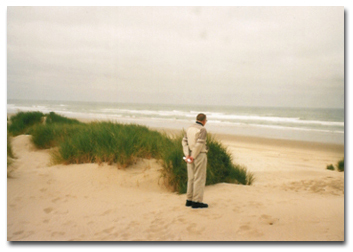 1980-2000: Archaeologists from Oregon start to investigate prehistoric wrecks on the Oregon coast as actual historical events, rather than legends, and several archaeological investigations are carried out in the Nehalem area. 2006: The Beeswax Wreck Research Project begins. 2015: Eb Giesecke, the historian who did more than any other to push for recognition of the Beeswax Wreck as a historical event rather than a legend, passes.